It is an easy to make breakfast or a snack item originated from Maharashtra. I have learned this from my neighbor who introduced this dish to me. I love this dish a lot because of the taste and texture of this dish. In one spoon you can taste the chewy sago seeds, soft potoatoes and the crunchy peanuts and the slight sourness from lemon. Simple to prepare flavourful breakfast. During the fasting time the Hindu's generally have this dish. Perfect dish for the Navarathri vrat too. It is a filling breakfast. After having this dish you wont feel hungry any more. Try this dish and let me know the results. Wash and soak the sago seeds for 2 hours or even overnight if you are planning to prepare for breakfast. Cube the potatoes into 1/2 centimeter cubes; set aside. Roast the peanuts and peel the skin if needed and coarsely grind it in a blender; set aside. Heat oil in a pan and Jeera and green chillies and curry leaves. Once it crackles add cubed potato and cook till soft in that oil. Add drained sago seeds, peanuts and grated coconut and salt. Mix well and sprinkle little water if necessary and cook for five minutes and switch off the gas. Immediately add some chopped coriander leaves and squeeze the lime juice; Mix well and serve hot. Wish i get a small bowl of this sabudana khichdi happily rite now, so tempting. I can finish it in one sitting........ looks tasty! Done to perfection.. Sabudana khicdi looks too good.. 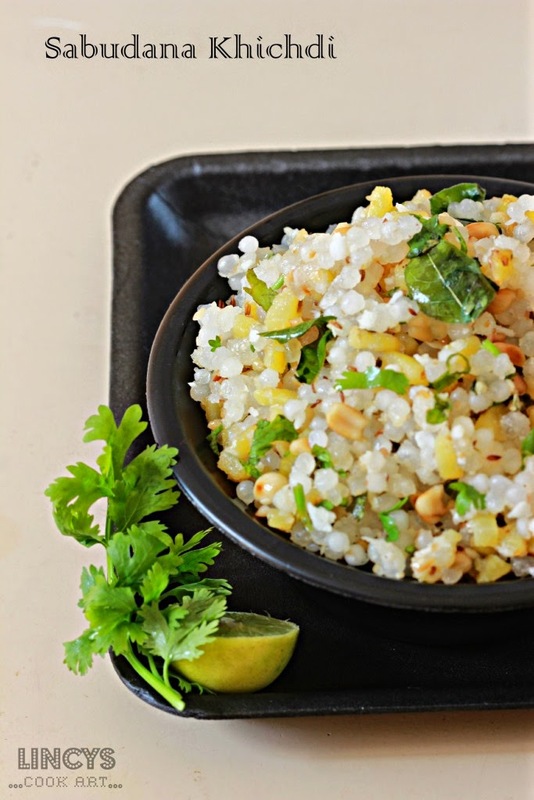 Healthy & delicious khichdi ,one of my favorite too.